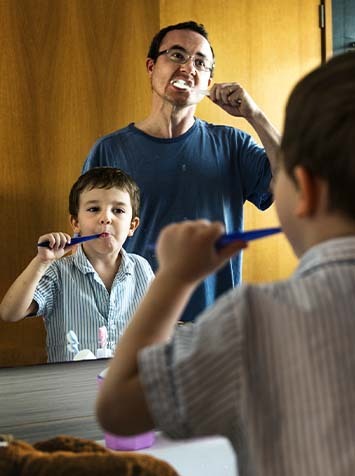 Brushing and flossing, along with professional cleanings at our Philadelphia dental office, are the most important things you can do to ensure a healthy, happy smile. Brushing disturbs plaque buildup, which prevents calculus from forming around the teeth. Plaque and calculus contribute to cavity formation and can inflame the gingiva, which can lead to gum disease. Flossing not only removes food from between teeth preventing dental decay, but also removes bacterial plaque, which can prevent gum disease. In order to keep your teeth and mouth healthy for a lifetime, brush your teeth after every meal when possible. If you are unable to brush, chew sugarless gum until you are able to brush. Floss at least once daily, preferably after your last meal. When you brush, pay attention to the gum line, the cheek side, and the tongue side of your teeth, in addition to the chewing side. The entire brushing and flossing routine should take about four minutes—two for brushing and two for flossing. If you have questions about your brushing and flossing technique, don’t hesitate to contact our Philadelphia dental office or ask Dr. Millan during your next appointment.